I am a Lecturer in Design at the Loughborough University whose work sits at the intersection of design, environmental studies and politics. My first book, Design/ Ecology/ Politics: Toward the Ecocene, was published in 2018.I completed an AHRC funded PhD on the visual communication of ecological literacy at the University of Brighton in 2012. 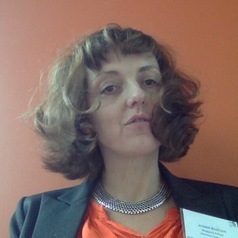 I have worked as a communication design researcher at the Centre for Science and Technology Policy Research, University of Colorado Boulder; the Centre for Research and Education in Arts and Media at the University of Westminster and the Centre for the Evaluation of Complexity Across the Nexus at the University of Surrey. I am the founder of EcoLabs, a design studio working in environmental communication and sustainable transitions since 2006. I tweet at @EcoLabs (high traffic) and @ecocene (low traffic).